Manitoba Aerospace is seeking the talents of a highly motivated person to fill the position of Recruitment Specialist. Manitoba Aerospace represents over 30 companies and more than 5300 employees. They also support numerous community programs to help interested people get the skills to find jobs in the industry. These are stories about some of those people and different support programs. Manitoba’s state-of-the-art aerospace and defence industries is the largest in Western Canada and home to a diversified group of world-class manufacturing, repair and overhaul, as well as service firms. The local industries are intensely export oriented; approximately 80% of our combined $2.2 billion in sales leaves the country. More and more, global customers and suppliers are looking to Manitoba aerospace and defence companies for value-based solutions. Within this guide you will find the innovative solution providers that will help you compete in the global market. Manitoba Aerospace ensures the education and training system works with industry to develop a skilled workforce, provides access to custom training so industry can remain competitive, and works with youth, parents, the Indigenous community and newcomers to Canada to ensure a steady supply of skilled workers into aerospace and defence manufacturing careers. 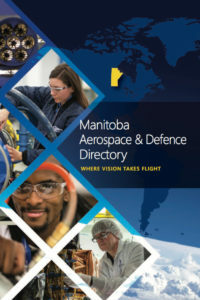 With a strong commitment to Small to Medium sized Businesses (SMBs) and an internationally recognised supplier development program, Manitoba Aerospace helps build the local and regional supply base, prepare suppliers to work with Original Equipment Manufacturers (OEMs), and Tier 1 and Tier 2 organizations, and supports improved access to global markets. 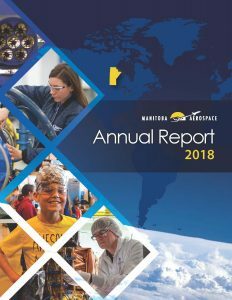 The Manitoba Aerospace Research and Technology Committee (MARTC) guides the development and application of the Manitoba Aerospace Technology Roadmap and helps ensure an innovation culture through award winning educational and applied research collaborations. Manitoba Aerospace is the voice for Manitoba’s aerospace and defence industries, promoting aerospace and defence as strategic industries and ensuring Manitoba companies are present and highly visible on the world stage. Manitoba has a long and proud history of aerospace success. From modest roots in small bush plane repair in the 1930′s, the Manitoba aerospace industry has grown to include sophisticated design, manufacturing, servicing, testing, certification, and research and development (R&D) capabilities. The Manitoba aerospace and defence industries now directly employs over 5,000 people. Take a look at some of the great career opportunities in our industry.